It is not always that you come across a book on Emil Zatopek. Richard Askwith’s biography of the great runner was both informative and a reminder of what humanity can do to the talent in its midst. A trip home to Thiruvananthapuram is never complete without a visit to Modern Book Centre. The last time I was there, the manager – he is the rare sort who recalls buyers’ interests – approached me with two books and said: I thought you may like these. I bought both. One of them was material I had waited long to come by. In his heydays Emil Zatopek ruled the disciplines he competed in. He trained hard, set records, won medals at the Olympics. 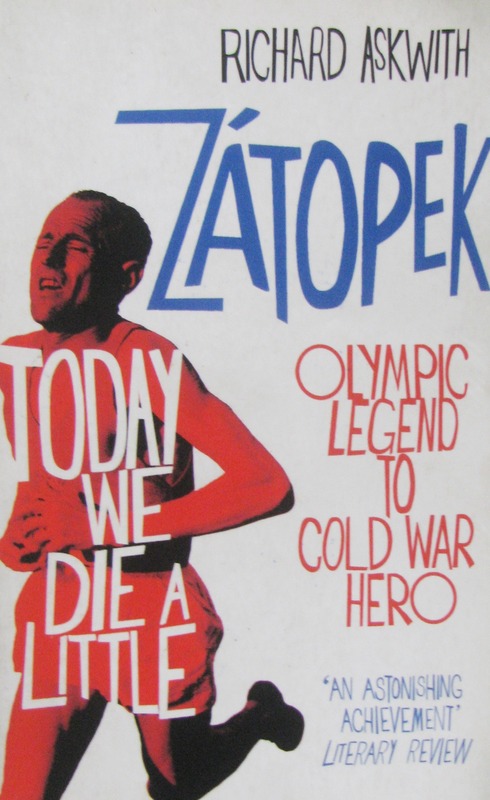 Richard Askwith’s book on Zatopek – Today We Die A Little – is recommended reading not because it is on a famous runner but because it sheds light on the life of a man we actually know little about. The research is extensive. The emergent picture is a composite of the athlete as remembered by those who knew him, including his wife and fellow athlete Dana Zatopkova, as well as material gathered by Askwith. A national icon in erstwhile Czechoslovakia, information on Zatopek is colored by popular myth and Iron Curtain-propaganda. Rendered famous by his athletic achievements he unwittingly became a mascot for the socialist block’s ascent in sports. His global fame shielded him from the capacity of totalitarian state to censure. He spoke and acted freer than many of his countrymen, not all of it palatable to political masters. He was also a humanist. He helped others, shared what he had and even gifted one his Olympic medals to a visiting Australian runner. Sociable and easily accessed, those who engaged with Zatopek evolved their versions of what he said. Truth, in such situation, is hard to come by. Notwithstanding considerable research, there are information gaps in Askwith’s book. There is also conjecture at places, to bridge the deficiency. The goodness of this book is that it narrates, admitting the gaps despite sizable research done. In the process you get an idea of Zatopek the person and the context he lived in. It is the interaction between the two that led to the Zatopek we know and crucially, the Zatopek we don’t know as well – a man who eventually paid the price for speaking up. A colonel in the Czechoslovakian army, he was dismissed from military service and faulted by the very state he earned accolades for. At the core of this predicament was Zatopek’s relationship with socialism. He appears to have agreed with it in principle but disagreed with the totalitarian approach implementing it. It is a relationship with two distinct halves. In the first, spanning the phases of upcoming athlete and Olympic hero, Zatopek periodically tests the state with his comments and actions but is spared reprimand. He is a hero; the people’s darling. In the second, spanning the phase past his athletic prime and deeds around Prague Spring (a season of counter revolutionary spirit in Czechoslovakia), the full weight of the system is brought to bear on him. It eventually cracks him. It is imagery that contrasts Zatopek’s famed capacity to endure on the track. But the pressure of state sponsored persecution is such. In totalitarian societies once you are tagged as wrong doer and word spreads, people avoid you. Not wishing others to suffer through association with him, Zatopek too kept to himself in that bleak phase. His eventual rehabilitation posed its share of risk to personal reputation. It delineated the contradictions in his life, which as athlete focused on sport – or perhaps, as someone trusting sport to build a better world – he seems to have overlooked. The Communist regime was backdrop for his ascent to world stage and the Olympics. Yet he questioned government. He empathized with Prague Spring when it unfolded and criticized the Soviet military crackdown that followed. After his dismissal from the army and years spent in nondescript jobs, he was put on the path to rehabilitation by the same Communist apparatus. So what is the real Emil Zatopek? Critics felt he wasn’t adequately clear on which side his political loyalty lay. The doubting didn’t end there. Totalitarian regimes maintain a sea of informants. Leading athletes like Zatopek, were under surveillance at home and overseas. It was a time when you didn’t know who was watching who. After Communism’s collapse in Czechoslovakia, Zatopek was doubted of being a former informant. Askwith investigates the angle as best as he can. He finds no direct evidence to prove the allegations hurled at one of the world’s greatest distance runners. Perhaps the best way to put it would be – Zatopek’s life away from race track reflected the troubled reality of East Europe in the years following Second World War and leading to the fall of the Berlin Wall. This is a story of the athlete as human being. If you are picking up this book to learn how one of the world’s greatest runners trained, you may be disappointed. Without doubt the descriptions of his grueling training schedules come alive in the narrative. As do the races. Askwith’s account of both is detailed. But all that training in military boots, the running in forests and snow and the victories at the Olympics is already the stuff of legend. Many of Zatopek’s techniques – including interval training, which he is said to have pioneered – have since been improved upon, with those doing so, smashing the records he set. Pick up this book, if you wish to know what happened to Emil Zatopek the person. Crammed with insight it is not a quick read. You have to be patient. The Cold War is over. Communism’s sphere of influence has shrunk. I read this book treating the predicament it portrayed as an example of what could happen when the same political system repeats in different garb. The correct perspective I believe, is to see it as pattern, an arrangement of power and authority diminishing individual freedom. Totalitarian regimes, propagandist media and witch hunts come in all political shades. The greatest impression Askwith’s book left on me was this: it made me wonder why Zatopek ran. What is it that he found in running? What is it that human beings still find in running? Something tells me that despite grand collectives like civilization, nation state, corporation, market and such, the individual would rather run away for a sense of existence.